I grow in my garden (or gardens, as the potted plant has followed my house moves) a juniper of impeccable provenance. It the semi-prostrate form of Juniperus communis and it is of known wild Welsh stock. To give its background briefly, juniper was known by Victorian botanists from Cadair Idris in Meirionydd, but its exact location was lost. In the early 1950s a small party of botanists re-found the plant and in that party was the late Mrs Paish, who lived at `Brynhyfryd` in Corris Uchaf, a slate-mining village north of Machynlleth. I lived at Corris exactly forty years and knew Mrs Paish and her husband well, often visiting their plant-rich garden. In that garden they grew a small bush of the Cadair juniper and I, in turn, was given some cuttings which duly rooted, and about 20 or so years ago I myself was able to give a plant to the NBGW at Llanarthne where, hopefully, it still thrives. Anyway - back to moths - I was `swotting up for the season` yesterday evening by reading the recommended `Micro-moth Field Tips` by Ben Smart, and noted that now is the time to check junipers for feeding damage. In my `new` garden, I have deliberately planted a couple of junipers, for moth rather than purely decorative purposes, and of course, I still have my Cadair juniper in a pot (in fact it has been recently potted up into a larger pot after some years of relative neglect). 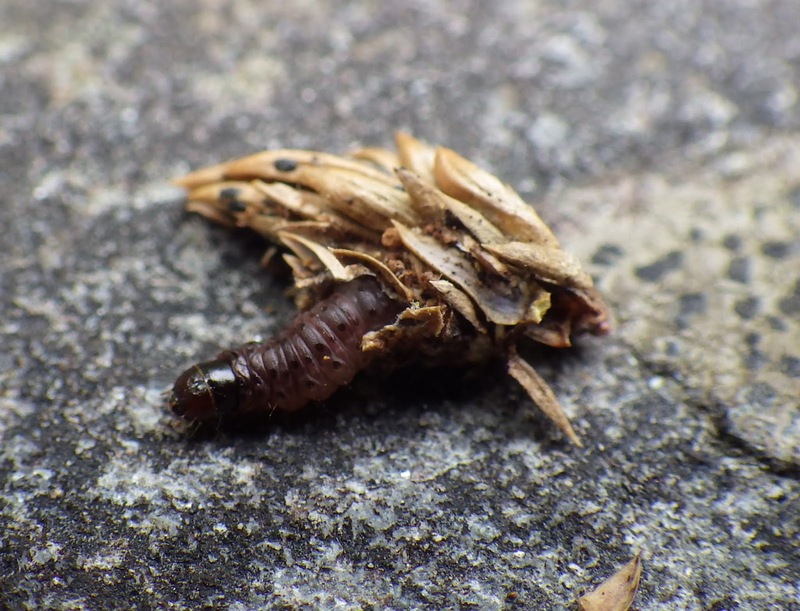 I noted that the latter has some - only a few - brown tips suggesting feeding damage and, upon opening the second one (the first was empty), a larva quickly made itself known. This individual has been potted up with some barely-damp compost in the hope that it will pupate and an adult will then emerge, as since there are several (up to seven) species of Argyresthia that feed on juniper, it is not a straightforward i/d; another micro also feeds on it. The other moth is Dichromeris marginella but its caterpillar does n`t look like mine and there at least two other gelechiids that feed on juniper. It may not even be an Argyresthia - I just don`t know at this stage. A polyphagous species may be another option. I`m new to rearing adults from larvae, so don`t hold your breath - but `fingers crossed`! Above: a `browned` juniper shoot (suggesting larval occupation). Below, a photo of the caterpillar.